Curtis Tarr, who served as Lawrence University president from 1963-69, died Friday, June 21 of natural causes at his home in Walnut Creek, Calif. He was 88. Curtis Tarr served as Lawrence University’s 12th president from 1963-69. An American historian and economist, Tarr came to Lawrence as the college’s 12th president at the age of 39 from Stanford University, where he was the assistant dean of the humanities and director of the summer school, a position that included faculty relations, financial affairs and advising undergraduates. Earlier in his career at Stanford, he served as assistant to the vice president and provost and assistant director of the summer school. A striking 6-foot-7-inches tall, Tarr led the college during one of the most significant events in Lawrence’s history —the consolidation with the all-women’s Milwaukee Downer College in 1964— as well as one of the most turbulent times in the nation’s history as student protests over the Vietnam War erupted on campuses across the country. He earned praise for his handling of the negotiations that led to the successful consolidation with Milwaukee-Downer and helped ease the potentially difficult transition for Milwaukee-Downer faculty, students and staff to Appleton. He also successfully managed to keep student unrest from engulfing Lawrence, where he made student responsibility a priority. His administration worked with faculty and students to adopt a demonstration policy, establish dormitory regulations, expand campus social life and create a governing council that represented all factions of the Lawrence community. Under Tarr’s leadership, academic offerings at Lawrence enjoyed a broader dimension. He oversaw the establishment of an overseas study center in Germany and an association with the Intercollegiate Center for Classical Studies in Rome. A master of music education program in the Conservatory of Music was added to the curriculum. 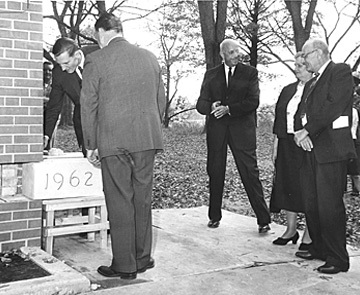 President Tarr (far left) lays the cornerstone for Trever Hall in October, 1963, one of a half dozen campus buildings he dedicated during his tenure. He also dedicated numerous buildings during his tenure, including Trever Hall, Youngchild Hall of Science, the Lawrence Bowl (later renamed the Banta Bowl), the Landis Health Center, Kohler Hall and Jason Downer Commons. In addition, Memorial Chapel underwent an extensive remodel and North House was converted to Mursell Education Center. Lawrence acquired its “northern campus,” the Bjorklunden Estate outside Baileys Harbor in Door County, in his presidency. Tarr nurtured a lifelong interest in art and literature. He spoke French, played the flute and amassed a beautiful collection of his own pen and ink drawings, drawn with creative detail throughout his life. Beginning in 1964, he diligently maintained a daily journal, which can be found in the Lawrence University library. He and his wife, Elizabeth, who died on his birthday last September, enjoyed hosting parties for the faculty at their home. Mrs. Tarr, a concert pianist who often entertained guests by playing the grand piano in the president’s residence, was instrumental in the development of the conservatory of music. Tarr loved to travel by all means of transport. He had visited every U.S. state by age 25 and traveled to 70 countries on business, government assignments and for pleasure during his life. He hiked 800 miles of the Appalachian Trail, bicycled widely and paddled his canoe in Minnesota’s Boundary Waters. He also flew light planes throughout his life and once broke the sound barrier in an F-4 fighter jet piloted by Chuck Yeager. Active in politics before coming to Lawrence—he ran for Congress in California and served on the state Republican Central Committee— Tarr returned to public service after leaving Lawrence, holding three presidential appointments in the Nixon administration during the Vietnam War: Assistant Secretary of the Air Force, where he worked on the transfer of arms and equipment to the government of Vietnam as American units withdrew from combat; director of the Selective Service System, where he sought equity to the drafting of thousands of young American men by instituting a lottery system based on birthdays that were picked on national television. ; and Under Secretary of State for Security Assistance, where he had responsibility for military programs with foreign nations. 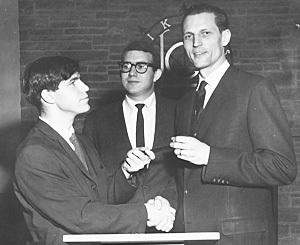 President Tarr Tarr passes the gavel to the new Student Senate president, Craig Harris ’68 on February 7, 1966, while outgoing president Mark Saltzman ’66 looks on. Following his service in Washington, D.C., Tarr became vice president of Deere & Co. in Moline, Ill. Retiring after a decade at Deere, he became Dean of the Samuel Curtis Johnson School of Management at Cornell University. He left Cornell in 1990 to become vice president of Intermet Corporation, in Atlanta, Ga., an international automobile parts manufacturer, where he oversaw foundries in Germany and Sweden. In retirement, he served on numerous boards, including that of Morehouse College, State Farm Insurance Corp., Banta Corp., and Bethesda Home in Savannah, Ga., the oldest children’s home in the United States. During his lifetime, he was recognized with five honorary doctoral degrees. Born Sept. 18, 1924 in Stockton, Calif., Tarr saw combat in World War II as a member of General George Patton’s Third Army in Europe, earning three battle stars. After the war, he earned a bachelor’s degree in economics from Stanford University and an MBA from Harvard University. He returned to Stanford to earn a Ph.D. in American history in 1962. He is survived by his wife Kay (Katherine), Walnut Creek, Calif., two daughters, Pamela Tarr of Los Angeles and Cynthia Tarr (Cliff Hugo) of Sonoma, Calif., a grandson Ace Buckley, Sonoma, and two sisters Muriel Kurtz of Eugene, Ore., and Marian Schreiter, Sacramento, Calif.
A memorial service is planned July 21 at 2 p.m. at San Ramon Valley United Methodist Church, 902 Danville Road, Alamo, Calif. Condolences can be directed to Kay Tarr, 3711 Terra Granada Drive #3B, Walnut Creek, CA 94595.